Obsession Spa - Calgary, Alberta Bio – About Us! Obsession Spa was started by myself Cera Jade in March 2010 originally under an alternate name. After moving to Calgary and receiving set after set of unsatisfactory, rushed nails, and never returning to the same salon twice for over a year I knew it was time to change this standard. Being spoiled in my previous home Victoria B.C. I was having my nails done by one of the most talented nail technicians I have come across, no doubt an industry leader in Canada. She quickly became a close friend and someone I kept in contact with through my nail trials and tribulations in Calgary. After deciding there was a definite need for a skilled tech in the area we arranged for her to teach me, not in a regular class of hers, but on a one-on-one basis in her home studio. With over eight years of experience and almost every brand you can names training, she provided elite coaching including all sorts of art, proper health information and product and brand knowledge. 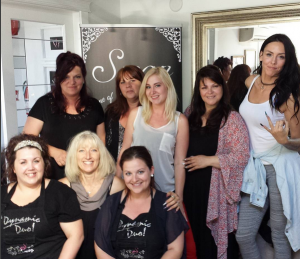 In 2012 after an unfortunate health issue left my nail instructor unable to continue in the industry I re-branded my salon as Obsession Spa, proudly carrying on her name and passion in the industry still today. Now in my seventh year in the industry I have added many new skills and services to my business including body waxing education through the Esthetic Institute, nail art classes with Ramona Hales, sculpting classes with the Dynamic Duo Natasha Harton and Christina Cronk and Rebalancing with Kinga Micaci. I became a certified INM Nail Educator in April 2014 with Lorena Marquez and then an Ugly Duckling Nail Educator in July 2016. The school portion of Obsession opened in January 2015, ambitious and dedicated to teach quality Esthetics to passionate students. I am always on top of trends, industry advancements and artistic improvements which keeps my knowledge and the salons flare on edge. Clients appreciate the extra care and personal time dedicated to each of them, leaving excited to show off their fabulous nails and always eager to return. Obsession takes each and every client and students needs, health, relaxation and sanitation seriously ensuring every individual has the utmost care in their home spa or school experience. Without the corporate luxuries of having walk-in clients and street advertisement, those who come to us receive executive treatment to ensure they leave with a genuine smile and enthusiastic eagerness to return and spread the word of wonderful service. 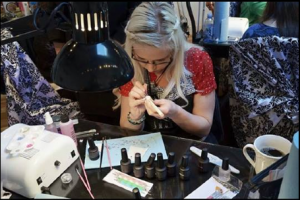 We have sought trial and error advice from nail educators and senior technicians and buy the best quality products from a few of the most advanced lines available. Our regime consists of using Ugly Duckling, Amor, Fuzion, Light Elegance, INM, LCN & NSI Gels, as well as EnVouge. We have well over 100 colours and limitless custom mixed colours. We create a ton of decals and art making it easy to meet special customer requests and continually advance designs and techniques. We also have a variation of Konad nail art that gives us the opportunity to offer clients a wide variety of quick and easy designs to choose from. We carry the Ugly duckling, Cuccio, Orly, le chat, china glaze & Gelavish lines of gel polish which we’ve had great wear with and love all the fun colour variety as well as exact colour match polishes. These are thin, easily soaked or filed off and provide longlasting unchipped wear and brilliant shine for those not wishing to do gel nails and are sick of regular polish imperfections. A gel overlay with imbedded art can be added to this service as well konad stamp art. We have an ever evolving array of products for all sorts of scents and sensitivities. Our products primarily consist of Guccio, LCN and INM brands but we you will never be surprised to see the newest products and brands popping up. We are very pleased with the new gel polish line from Ugly duckling happily carrying a variation of colours and add ons. We strictly use Thuya tint as it is a safe, Canadian approved coal tar free formula, leaving your lashes or brows looking fuller and darker. Please be careful when getting anything on your face tinted as there are many products on the market that are not approved. Refectocil and other brands are known for containing coal tar based dyes with p-phenylene-diamine which can cause blindness and advises right on the bottle “This product must not be used for dyeing the eyelashes or eyebrows; to do so may cause blindness.” They are prohibited for use on the eyes in Canada, yet are still sold and used to tint daily. Make sure you only utilize services from responsible, knowledgeable, Estheticians. Fake Bake® is a revolutionary organically-based tanning formula that utilizes a unique recipe with all natural tanning agents DHA and Erythulose but is Paraben free! Its unique formula doesn’t clog pores, is personalized to various skin tones, water soluble, won’t stain most clothing and gives an even healthy bronze tan, not orange! It can accelerate any other form of sun tanning and the active ingredient DHA occurs naturally in sugar beets and has been approved for use on the skin for over 30 years. DHA soaks into the outermost layer of the skin and causes the superficial layers of the epidermis to oxidize. This naturally produces a colour change and darkens the skin. As the skin cells gradually wear off the colour slowly starts fades, just like a UV sun tan but without the harmful effects of sun damage, although we do always recommend using sunblock when engaging in any form of sun tanning. Obsession has had great success with the Satin Smooth line of waxes for all sensitivities, hair and skin types. We typically have on hand the deluxe antibacterial cream wax which is great for all skin and hair types but does especially help those with dehydrated or thin skin. Tea Tree wax which is a nice therapeutic wax containing tea tree oil and eucalyptus that have natural calming extracts that penetrate pores to relax and release hair follicles. great on sensitive areas like neck and underarms. Ultra Sensitive Zinc Oxide Wax is specially formulated for acne- or blemish-prone skin, fair complexions, thin or young skin also great for clients with sensitive skin that need a depilatory wax that protects them from irritation or rashes. ORGANIC soy wax. It is all natural, pure organic enriched with vitamin E, Titanium Dioxide and other wholesome nutrients that maximize hair removal and protect skin. removes fine to medium hair on sensitive skin. I also carry Aloe Cream Wax, Lavender Cream Wax, Wild Cherry Hard Wax the regular honey wax enriched with vitamin E Last I have my favorite wax, a specialized Brazilian hard wax. The Citrus Mojito Thin Film Hard wax is a no strip antibacterial wax designed for medium to coarse hair. It’s infused with vitamin C and natural spearmint to calm and soothe skin. Its incredibly gentle and pulls very clean. Whether its a full set or fill, your nail care is taken seriously from the start to finish of your service. The electric file is NEVER used on a natural nail, the cuticles are pushed and trimmed for a fresh clean look and extra care is taken to make sure the nail is properly prepped to ensure long lasting accurately applied set of nails is done. After choosing from a huge array of colours, designs and decals our clients nails are sculpted to suit their exact expectations of shape, length and width. 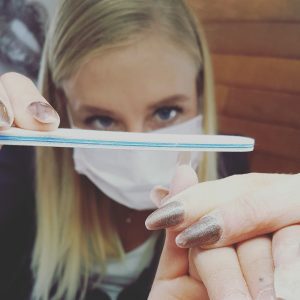 Please note, during a fill we do not just buff the top layer of gel off and reseal the nail, we completely reconstruct the nail after removing almost all the gel but the very bottom base layer. Every nail service is finished with a revitalizing cuticle oil treatment and a choice of delicious moisturizers. Our tan system is exclusive and precise, working with your natural skin tone to achieve the perfect bronze sun tan, not orange spray tan. Offering the added bonus of travel, we can come to you in the comfort of your own home, leaving absolutely no mess! Hosting a tan party is a great way to spend an evening with friends and receive a free tan! You can rest assured that we will not only be professional but proper before and after care will be thoroughly explained to get the most out of each tan. You can feel confident any questions or concerns you or your friends may have will be answered in full. We also carry the exclusive line of body products designed to work with the Fake Bake tan system. Host a party with over 10 spray tan guests and receive not only a free tan but also hostess gift pack!